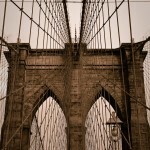 This is a fairly standard shot of the Brooklyn Bridge in New York City. This is a shot of one of the towers that I took as I was walking from Manhattan to Brooklyn. This was the first time I had walked on the bridge and it was an interesting experience. I think the thing that struck me the most was the geometric patterns created by all the suspension wires. I tried to capture that in this shot. In processing, I converted from color to black and white and then added a sepia tone. I also added a bit of simulated film grain to give a more vintage feeling to the image. 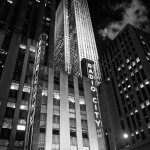 This is a shot of Radio City Music Hall in New York City. In the background you can also see 30 Rockefeller Center. I was in town on business and walked down to Rockefeller Center to take some shots. I didn’t have a tripod so I had to do everything hand held. I remember standing across the street from Radio City to take this shot. I tried to support myself has best I could in order to get a clean shot. My Olympus E-3 has in camera stabilization and I think that helped keep the shot clear as well.